For a single Cincinnati or Dayton cleaning or a yearly schedule, we have many decades of experience and the latest pumping equipment to do the job right. Best of all, our fees are more than competitive. While other services will quote a one-size-fits-all fee. We’ll work with you because not all traps are created equal. Some are large. Some are small. Some need more frequent pumps. Some need fewer. Your fee will be set for your unique situation, and we’ll quote you a price over the phone. Proper interior grease trap and exterior grease tank servicing is necessary to keep the rest of your indoor pipes running smoothly. Fats, oils, grease and solids can build up in your pipes causing back-ups if service is not consistent. 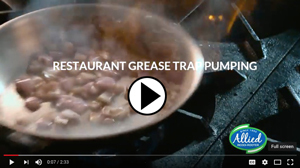 Some towns require a specific frequency for grease trap services. Allied Reddi-Rooter provides meticulous inside and outside grease pumping to the food service industry, retirement homes, school dining facilities, apartment houses, manufacturing facilities, etc. Our technicians will not only clean out your interior grease traps, they will properly scrape down the walls of the trap and inspect the condition of the trap itself, baffles and cover. Your Allied Reddi-Rooter technician will review and update the paperwork on all of your interior traps and recommend the appropriate service frequency based on the condition of those traps. Our technician will also update the service log appropriately to provide health department inspectors with the proper documentation. Any trap’s a snap with Allied Reddi-Rooter! please contact us today at 513-396-5300.